Based on the award-winning TV series “The Way of the Master,” the Intermediate Training Course builds upon the foundational teaching of the Basic Training Course and is designed to further equip believers in a group setting to simply and confidently share the gospel with family, friends, and strangers. This eight-session DVD course adds critical framework to your foundation. 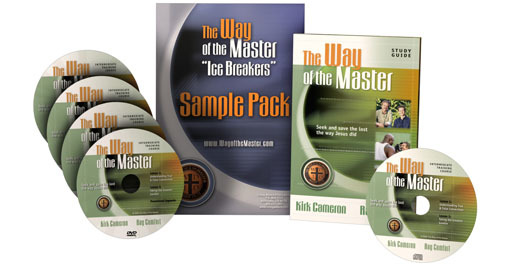 It will teach you how to avoid the devastating pitfalls of producing false conversions. You will learn how to prove the existence of hell, both through the Scriptures and through reason, and what to do when things go wrong. Discover how to witness to a family member or to someone who is gay, how to recognize subtle satanic doctrines, how to refute the theory of evolution (join Kirk and Ray as they take an orangutan to lunch), and how to prove the existence of God. Using a captivating teaching style, Kirk and Ray not only tell you how to witness, they show you, through fascinating on-the-street conversations with atheists, intellectuals, evolutionists, homosexuals — and perhaps the most intimidating — family members. Once you’ve experienced the exhilaration of sharing the gospel, weekly homework assignments will help you put this life-changing teaching into practice as you discover additional creative ways to reach the lost. Like countless others, you will be amazed at how using this biblical method will transform your life — and the eternal lives of others. PLEASE NOTE: This Course contains one study guide. You will need to purchase additional study guides for each person in your class. Also, the audio CD’s are no longer a part of this Course.